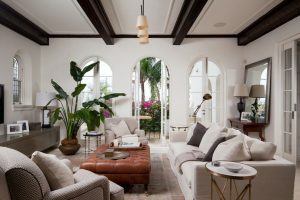 If you are looking for an exotic, tropical feeling in your home, an indoor palm will make your home look very tropical. Here are some important tips that will help your palms stay healthy and lush. The importance of room temperature – You needs to keep your indoor palm at a room temperature of 60-70 degrees and 60F at night. In winter months, keep your palms away from the draft and at a room temperature of 45F to avoid cold injury. Avoid too much direct sunlight – Too much direct sunlight will cause your palm leaves to go brown or gray. Therefore, place your palm next to an east or south facing window that allows filtered light to come in. Know how to water properly – Palms require water and should never be left to dry out. Water your palm until the water drains out of the drainage tray. Always remove excess water from the drainage tray between waterings. Avoid over watering your palm and water only when the top soil is dry, and the bottom soil is wet. Avoid too much fertilizer – Too much fertilizer can leave your leaves brown and cause burning. If you are using slow release or diluted fertilizer, add it when the plant is actively growing. You will see active growth from late winter through early fall. For those who are unsure about how much fertilizer to add, it is best to add little, check the growth of the plant and then add more if needed.